It was more than two decades and hundreds of games ago, but Keith Hendrickson remembers all too well his first foray into the playoffs as head coach at Virginia/Mountain Iron-Buhl. “My first year in Virginia we won five games had to go to Babbit to play a first-round playoff game,” Hendrickson said. “And we lost it. Hendrickson, who has resigned his position after 25 years coaching the Blue Devils, guided Virginia to its first state tournament appearance in 2005. The Blue Devils made subsequent trips in 2009 and 2010 and reached the Section 7A finals again this season before losing to Hibbing/Chisholm. Virginia finished with a 20-8-0 record. Over the last eight years, Virginia has averaged 20 wins per season. The Blue Devils have produced numerous Division I college players during Hendrickson's tenure. Matt Niskanen, a former Virginia and University of Minnesota-Duluth standout, is a defenseman for the Pittsburgh Penguins. “Over the years there have been a lot of great kids,” Hendrickson said. “A tremendous amount of really high end kids that have gone on to college and not necessarily played hockey. They are fathers and husbands and contributing adults. Hendrickson, 53, submitted his resignation papers during the season. His departure was made official during a school board meeting on Monday, March 14. Hendrickson’s son, Garrett, scored 28 goals and added 48 assists as a senior forward for the Blue Devils. He is St. Cloud State recruit who might play as a freshman for the Huskies next season or spend a year playing junior hockey before enrolling. Keith Hendrickson said it’s possible Garrett could play next season for the Penticton Vees in the British Columbia Hockey League. "They were always very good offensively," longtime Hibbing coach Mark DeCenzo said. "Not to say they weren't good defensively, but there was always something you had to shut down in order to be successful against them." 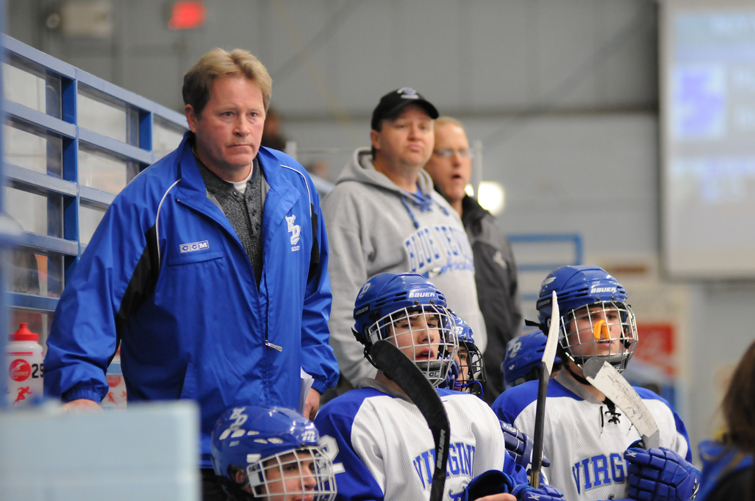 Early in his career with the Blue Devils, Hendrickson became heavily involved in Virginia’s youth hockey program. He also was instrumental in getting a second indoor ice sheet added to Virginia’s Miners Memorial Arena. Hendrickson said longtime assistant coach Gary Cornell also has resigned. O'Neill coached the Raiders to the 2006 AA state title. Lucas McGregor helped the Cougars reach the Class 2A state tourney. The Spartans clipped the Cardinals 2-1 to clinch their first state title.